We pause this week to be with Jesus in death. There are few moments of intimacy greater than the privilege of being with someone we love in the last hours of his or her life. We want to enter into the whole scene that surrounds his death and the treasured memories of the early Christian communities. We also want to connect the meaning of Jesus’ death for us with the realities of our everyday lives. We want to consciously move through our days with a heightened sense of awareness about how his death gives hope to us in our fidelity, our struggles, each day. We begin by prayerfully reading the accounts of the scene at Calvary, in Luke and John. We enter these scenes with our own imagination — where we choose to stand, where we look, what others are saying, what we feel. It is very important to imagine the scene of taking him down from the cross and, perhaps to join in the tender cleaning of his body and the sorrowful carrying it to the tomb. The reality of death is complete. We then can let these images fill the background of each day. From the earliest conscious thoughts of our morning to the final concluding thoughts of our day, we want to let ourselves be touched by the death of Jesus for us. •	Our Sin. What we have done, what we are doing, and what we are tempted to do to separate ourselves from God, as well as all the ways we fall short of self-sacrificing love. •	Difficulties with Others. All the conflicts in our day-to-day life with difficult people that lead to mutual suffering, hurts, and the breakdown of unity. •	Sin in the World. The stories that fill the headlines and the day-to-day world around us: war, genocide, dehumanizing social structures, the unjust distribution of the world’s wealth and resources, political oppression, abortion, child abuse, the drug economy, all senseless violence, capital punishment, bigotry, demagoguery, the destruction of our environment, dishonesty, infidelity, greed, consumerism. Use the resources here to help with this wonderful week of being with Jesus in his death for us. 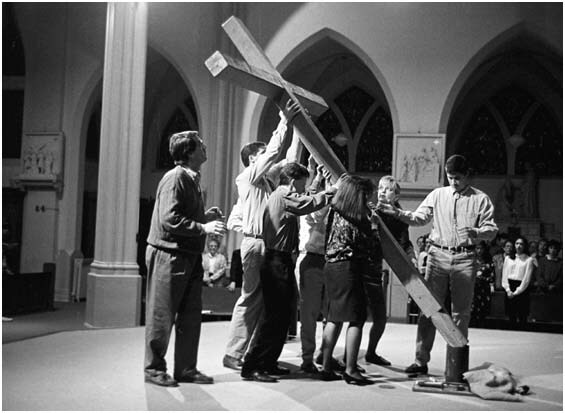 Use the stations of the cross to enter the experience more personally. Let us all give thanks each evening for the one who shows us the deepest meaning of the Good News — we are free from the power of sin and death over us. By entering our life and death completely, Jesus fell into the hands of a loving God, who raised him and us to life, redeeming all sin and death forever. along the way of the cross.